The Dublin & Kingstown commenced operations in 1834. Today, the line is part of Irish Rail’s national network and also hosts Dublin Area Rapid Transit suburban electric trains. In August 2018, I exposed this view of the down evening Dublin-Rosslare passenger train approaching Blackrock along the shore of Dublin Bay. 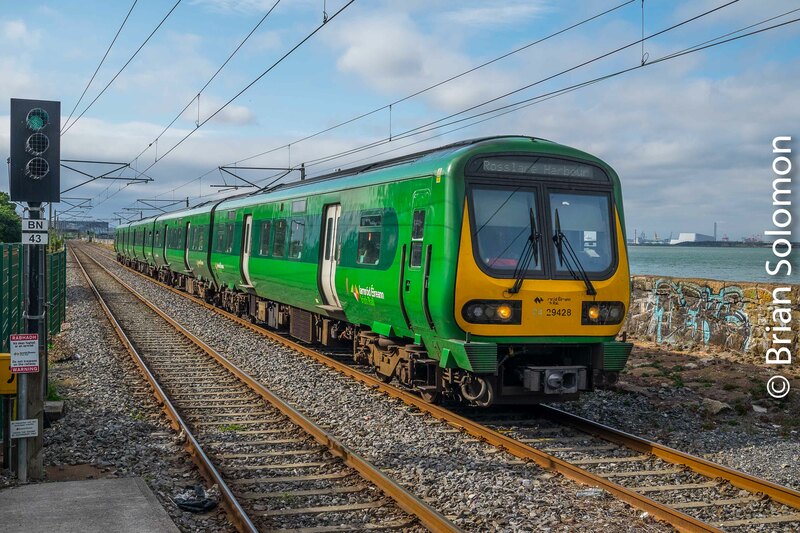 I like the modern candy-apple green livery that now graces some of Irish Rail 29000-series diesel railcars, and I find that it works especially well in a scene such as this one. To make for a more appealing photograph, I imported the camera RAW into Lightroom and made a few minor adjustments to contrast and color temperature. Among my most important changes was to lighten the shadow areas to more closely represent what we see with our eyes. The Dublin and Kingstown Railway dates to 1834, which makes it among the earliest steam railways built outside of England. Today the route composes a part of Irish Rail’s electrified Dublin Area Rapid Transit system. Outer suburban and Intercity trains (to Rosslare), plus occasional Railway Preservation Society Ireland steam trains also use the line. Much of the old D&K is scenically situated along the Irish Sea, yet the electrification masts and wires, combined with sea walls, fences, graffiti and suburban growth can make it difficult to obtain a satisfactory vista with the line. In late August, I rode the DART from Tara Street Station to Blackrock, where I exposed these views using my FujiFilm XT1. My train accelerates away from the platform at Blackrock. The modern footbridge makes for a dominant visual element, but also offers a photo platform. A Dublin bound German-built DART train approaches Blackrock. I aimed to feature the terrace houses above the line while minimizing the visually obnoxious elements of catenary and graffiti covered seawalls. This view from the modern footbridge shows the old Blackrock Station. Here soft lighting is a real benefit. I applaud Irish Rail for installing attractive maps near the station. More of this please. Looking toward Blackrock station and Dublin. A 29000-series diesel multiple-unit approaches Blackrock. I made this view from the public footbridge south of the station. Here the terrace houses make for added interest and a nice compositional element. The Irish Sea is on my left, but there’s a host of ugliness between the railway and the water. Here, soft afternoon lighting helped minimize obtrusive elements, but there’s little in the photographs that convey the historic significance of the line. Tracking the Light offers a daily views on railway photography.